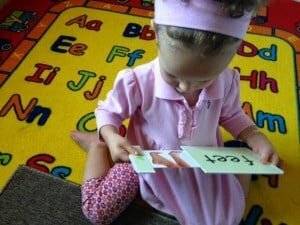 Have you ever attempted to homeschool a toddler? 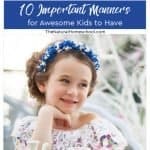 If you have, you have probably realized how they are extremely tactile, how they love to explore new and exciting things and how they have a short attention span. To maximize this precious one-on-one time with them, it is important to focus on one thing and one thing only: flexibility. 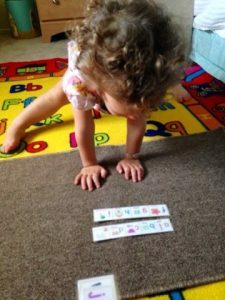 With toddlers, as with infants and newborns, it doesn’t matter how prepared you are or how much you have planned for this time. It will happen in their time and in their way. 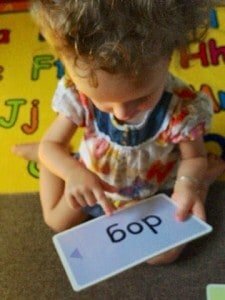 As stressful as that may sound, in the end, it is best to follow the child because that is how she learns best. Here, I present to you three easy review lessons to keep things short, fun and moving along. 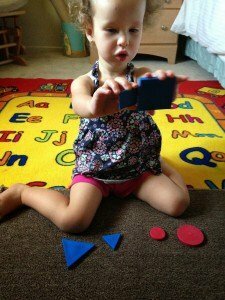 This is not to tell you what to teach or how to teach it, but rather how it works for our family in hopes that this will inspire you to get ideas and come up with your own fun and easy activities that your toddler will simply love and enjoy revisiting when you invite her again to join in. 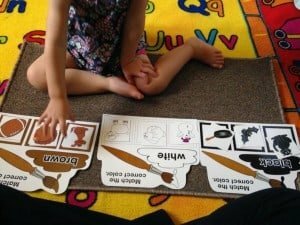 These lessons are geared for toddlers that are 2-3 years old, but you can start some of these activities sooner and make them more complex as they get older and/or master the skills. The amount of time each session takes varies. I follow her and keep an eye on her attention span for that day. I usually have more material than what we use, just to be ready. 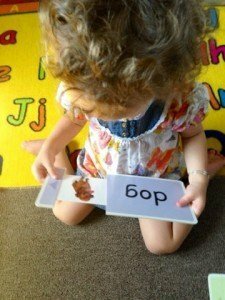 Usually, our lessons are about 30 minutes long, but sometimes as little as 15 minutes, so we break up our lesson into two parts and come back later for the other half. The materials are easy to find. 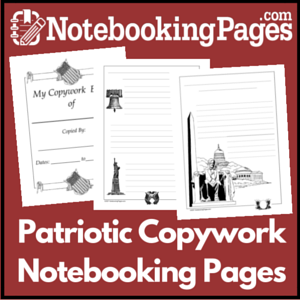 You can buy them, find them for free online or simply make your own. 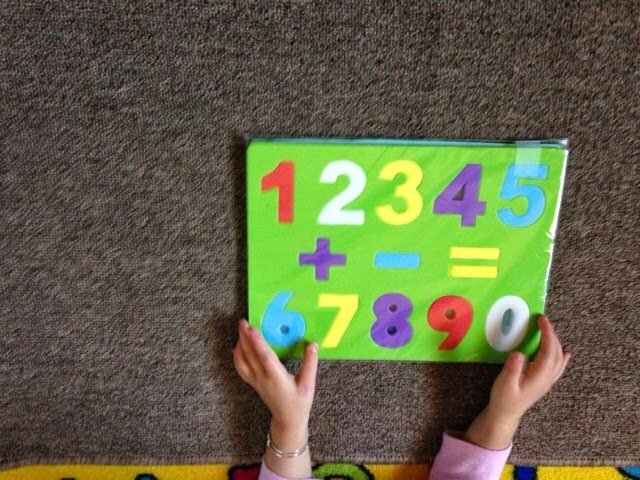 This is the order in which we do our review lessons (order and content on numbers 3-10 may vary): 1. First, she removes her shoes and places them in the designated basket. 2. 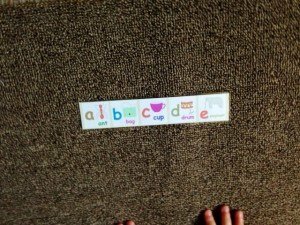 Next, she gets the mat, places it on the carpet and unrolls it. 3. 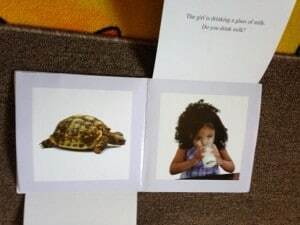 We reviewed animal flashcards with pictures and names. 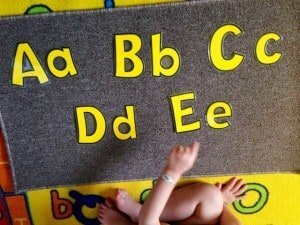 I made these myself but here are some really great ones that include several sets (alphabet, numbers, animals, shapes, etc). 4. 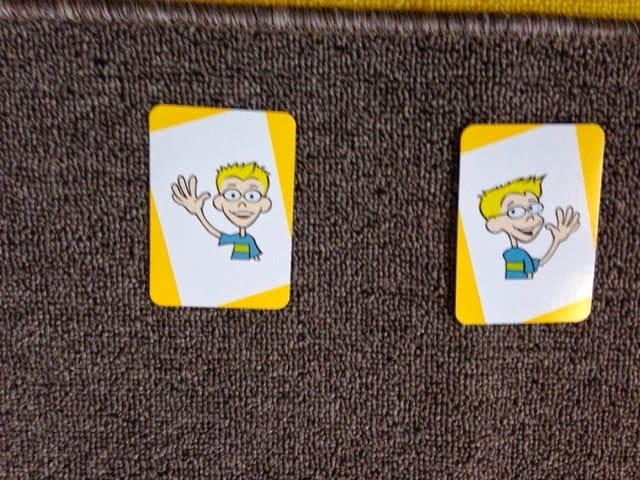 We learn to say “hello” and “goodbye” in English, Spanish, French and Chinese using various language flashcards. 5. 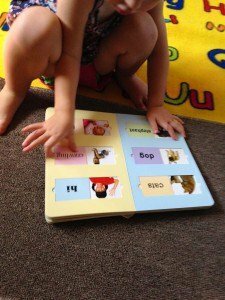 Next, we go over all the shapes and colors we have learned so far in English and Spanish using a laminated placemat and flashcards. 6. 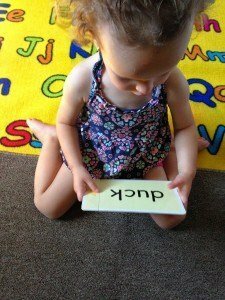 She knows her alphabet very well, but I still like to keep it fresh and so we go over it twice every time we meet. 7. 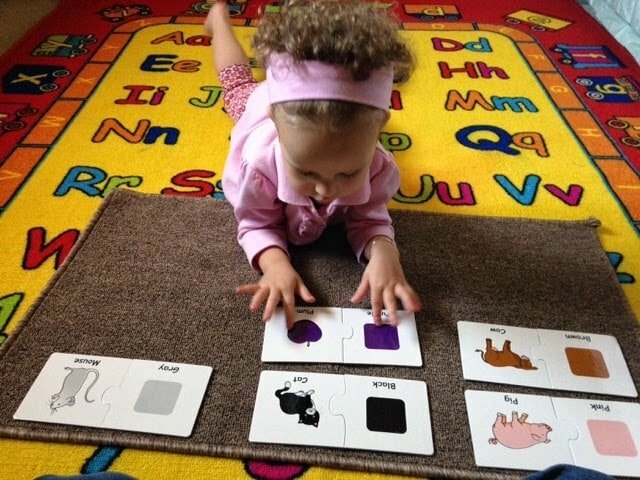 Now, we do some color matching with 2-piece puzzles. 8. Numbers 0-10 were her favorite back then. 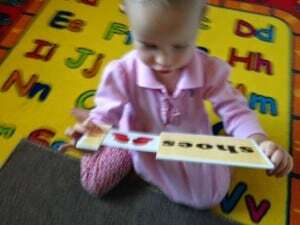 Now, a few months later, she can count up to 30. 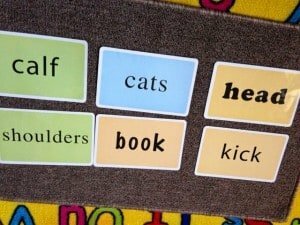 We use these simple punch-out numbers (the set includes letters and punctuation) and foam numbers. 9. 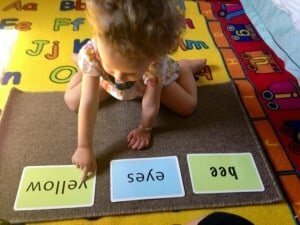 We like to practice reading sight words using books from “Your Baby Can Read.” The program “Teach My Toddler” can also offer some great options for this age group. 10. 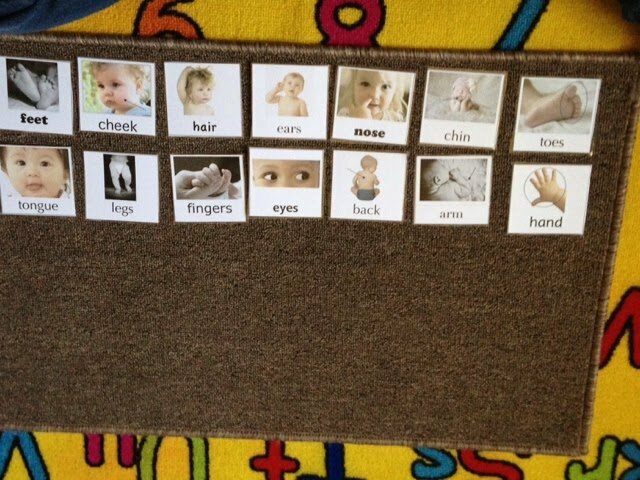 Lastly, we talk about body parts. I made these myself with images off the internet. My first attempt at printables for home use only. 11. 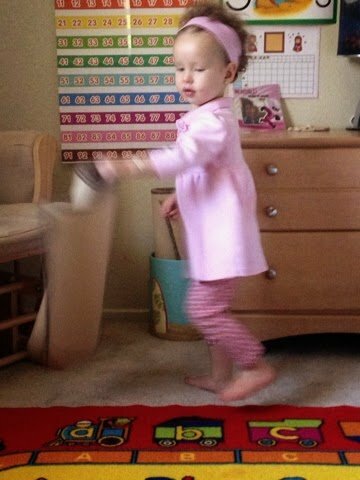 She will roll up mat and put it away by herself. 12. 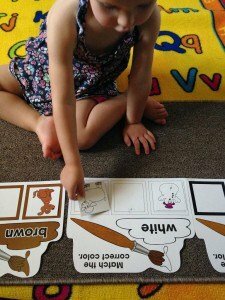 She puts her shoes back on and we exit the homeschool room. She really loves to homeschool with me. 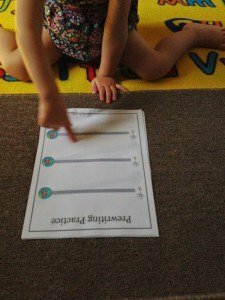 It is so special to her to get one-on-one attention and the activities that we do are fun and engaging for her. I don’t have as much one-on-one time with her as I did with her older brother at this age, but I do what I can, as we all do. 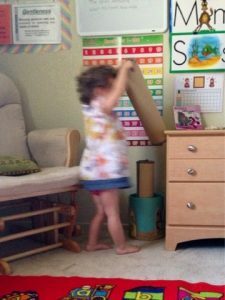 She gets her mat and unrolls it after she has taken her shoes off. 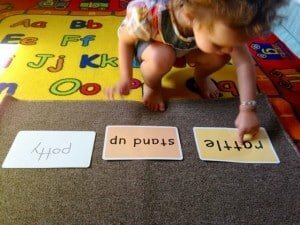 Out of three sight words, she can recognize them all and points at the correct one when asked. 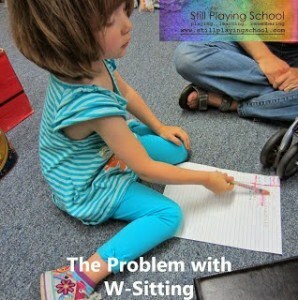 Needless to say, not only did I correct her sitting (numerous times and she finds it comfortable to sit like that), but I also urge you to do the same. 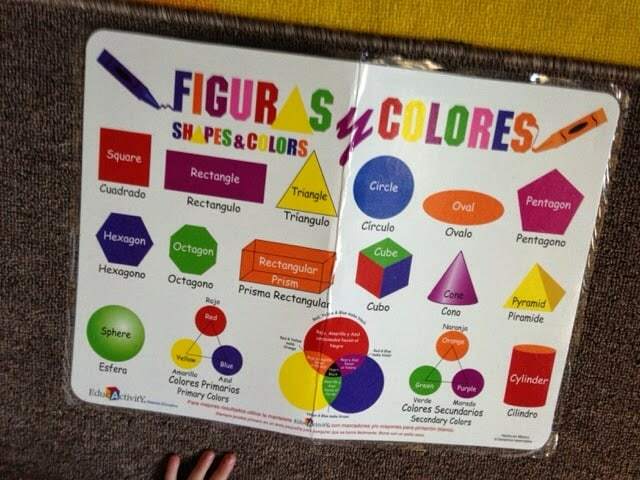 Here is our shape activity this time. 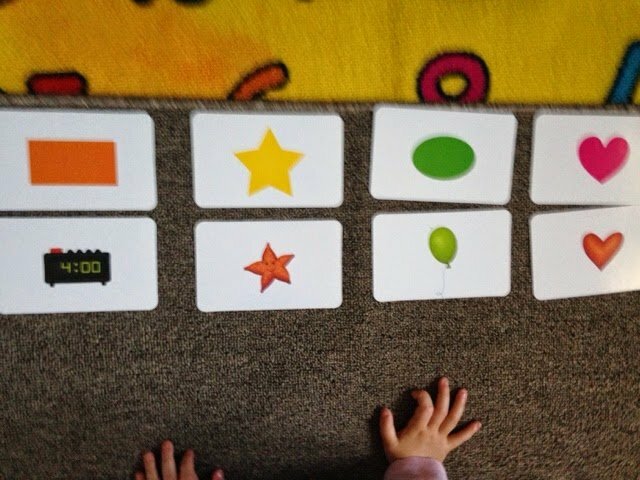 Shapes and flashcards. Simple and fun. 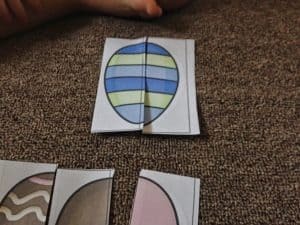 I have since added a rectangle, an oval and a diamond with their matching pictures. 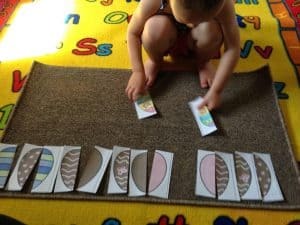 Here is our number activity (1-6). Can you believe it? 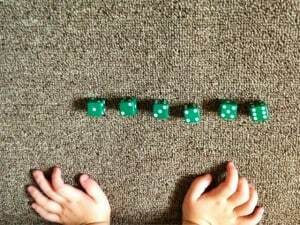 Something as simple as dice can fascinate a child. 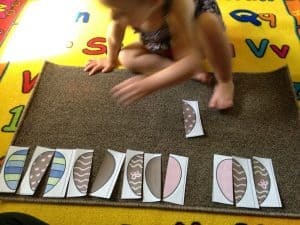 I loved seeing her little face light up when she would find the right number of dots on each die. 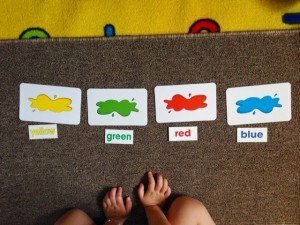 This is our color activity today. After she mastered these, I added black, white and gray. After that, I added purple, orange and pink. 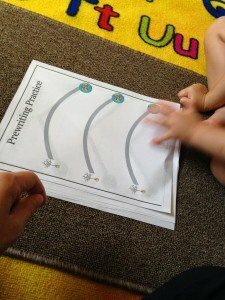 Our alphabet activity is a 2-part activity. 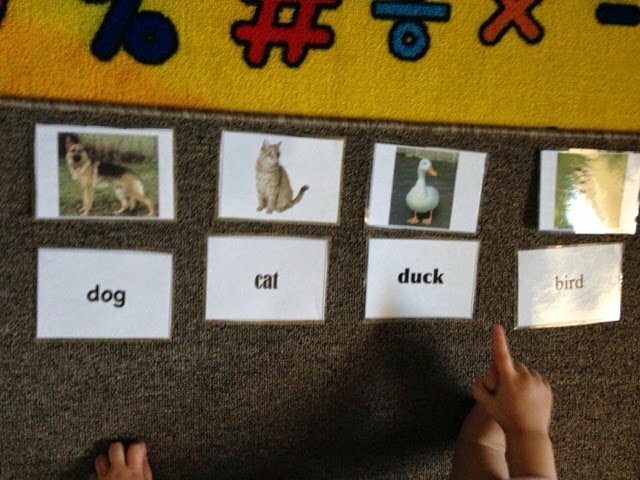 First, we studied A-E and a-e and matched them up. 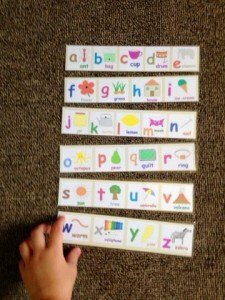 These are simple punch-out letters that I laminated. 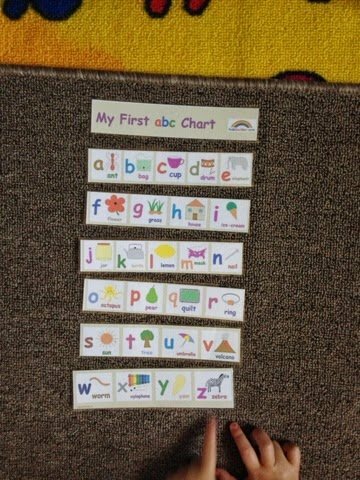 Then, we got our alphabet strips and put them in order. 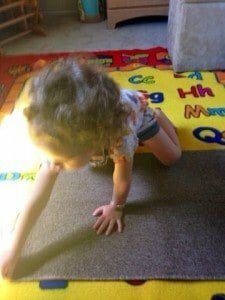 When we were done, she rolled up her mat on her own and put it away. 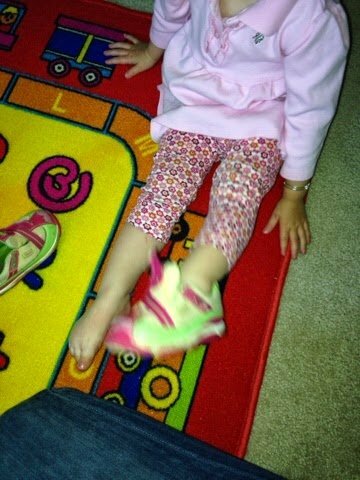 Then we put our shoes on and exited the homeschool room. 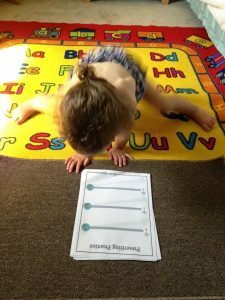 Assessment post-lesson: I am positive that she is outgrowing pretty much all of the activities I have for her, so it is time to kick it up a notch. 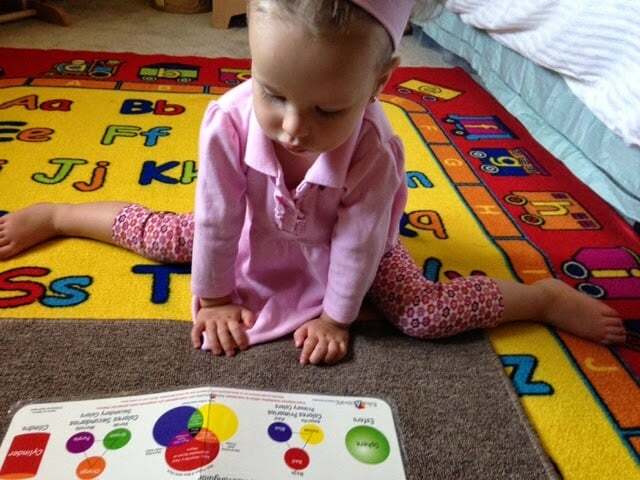 Getting my wheels turning to set simple lessons full of discoveries up for her. I am so excited. 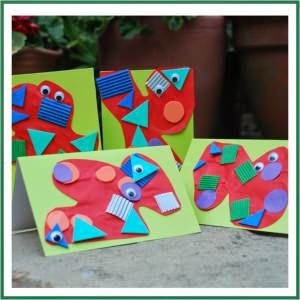 The printables you see here are the Easter Tot Pack from 3 Dinosaurs. 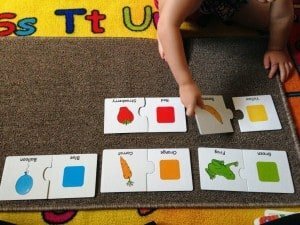 We printed, cut and put together these 2-piece puzzles. 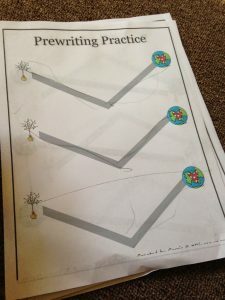 We also worked on some pre-writing activities. Aren’t these great?! And yes, I did correct the “W” sit (again). This is definitely proving the be a strong habit in her. 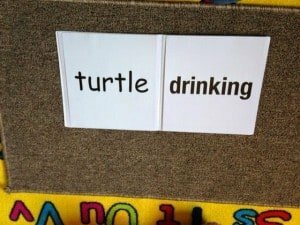 These are our two color activities. 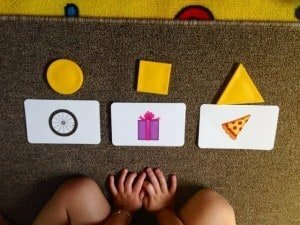 Our shapes activity today included learning “small” and “big.” We used simple shapes to come up with so many different activities. She did very well with this review. I can tell she loves learning and reviewing. 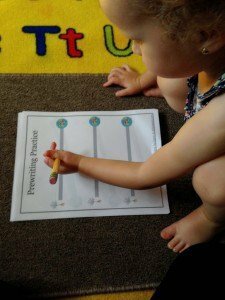 Review is not only important for children to keep the information fresh and build a strong foundation, but it is also important for them to feel successful. 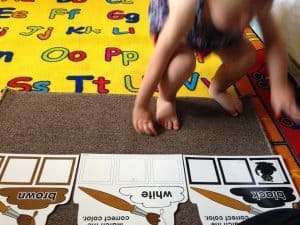 I highly recommend that you try putting together these lessons for your toddler. 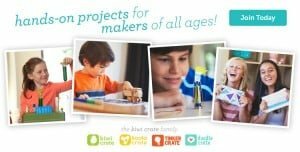 Look around what you have around the house and in the toy box. 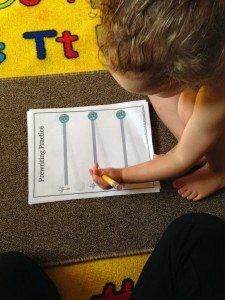 Find inexpensive educational materials and find free printables that your toddler will thoroughly enjoy and learn without even knowing that they are becoming smarter.